Below I have collected a series of quotes which I could potentially use for the Type Triathlon brief. I have collected a series of inspiring quotes, from philosophy to everyday motivations. I have decided to collect a series of different quotes in order to choose an appropriate quote with an interesting background, which can be reflect via typography and the background image chosen. "Lion doesn't lose sleep over the opinion of sheep"
"The happiest people don't the best of everything, they just make the best of everything"
The quote I have decided to go with for this brief, is "A lion doesn't lose sleep over the opinion of sheep" as this is one of my personal favourite quotes and mottos which I would like to bring forward in a typographic manner. The only existing versions of this quote which have been 'designed' are those digital productions which are in monochrome and feature digital type. 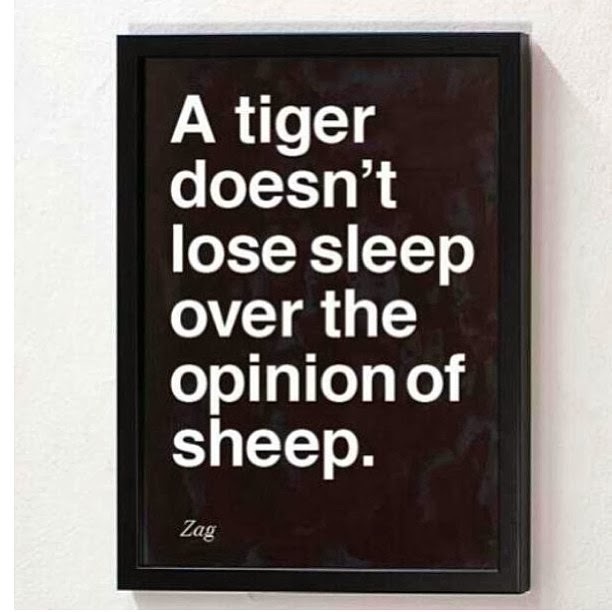 There are also variations of the use of 'tiger' or 'lion' which vary depending on where you view the quote, however 'Lion' has always been used in the original. I would like to try this in a hand rendered manner, and experiment with three different types of font, serif, sans serif and italic.